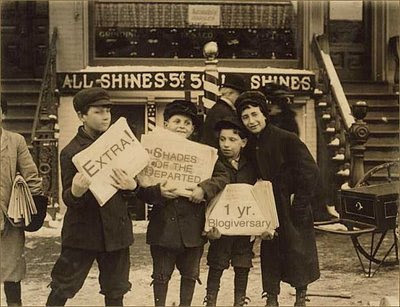 Yes, today is Shades one year blogiversary. Shades has lasted longer than three of my Aunt M's marriages; and we're better looking than all seven of her husbands. It has been a great year! Friday From The Collector's has seen 32 columns, Shades now has eight permanent Weekend With Shades columnists, we've traveled through history with Twice Told Tuesday, Wandered The Web on Wednesday, talked about Many Things on Thursday, discussed I think She's Dead, the Little Girl Wearing Pearls, and The Shot that started the year. We have heard from and reunited families with their photographs and history. Smile for The Camera, A Carnival of Images, celebrates it's 11th Edition today. Each carnival just keeps getting better and better. Admission is free with a photograph and Shades' readers have graced Smile with the most wonderful photographs. I want to thank Shades' readers; for their loyalty, pity comments, spirit of giving and friendship. Thank You! Would I be selfish in asking for another year equally as good or better? I hope not, because that is my wish. Here's to many more Shades of the Departed! Happy Anniversary! Thanks for all you do, your blog is so enjoyable! You do an absolutely amazing job!!! Love the photo of the newsboys! Congratulations, fM!!! It's always a delight to read "Shades" and I look forward to many more wonderful and sometimes surprising articles. Mazel tov! You have done a bang up job with Shades and I can't believe it has been a year already! Congratulations and best wishes to the Hostess with the Mostest. It is an honor to be a part of the Shades community. May all you wishes come true and may Shades live long after Aunt M.
Shades was one of my first and I don't even remember how I found her. But you and fM have delightful company. Congratulations on your blogiversary. May you have many more! Congratulations! It's a joy to read and a joy to participate! Hear, hear! Congratulations on a fabulous premiere year of Shades. Looking forward to many more. Wow! A year has gone by? Amazing! Shades Of The Departed is the BOMB! Hear! Hear! Congratulations! Can't believe it's been a whole year! Happy Blogiversary, I wish you many more! 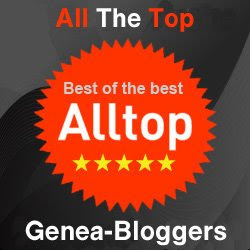 HAPPY BLOGAVERSARY TO YOU, HAPPY BLOGAVERSARY TO YOU, HAPPY BLOGAVERSARY DEAR FOOTNOTEMAAAAAVENNN, HAPPY BLOGAVERSARY TO YOU! I remember your inaugural article on Shades of the Departed and cannot believe a year has passed already. This blog is such a treasure-trove of amazing photographs, and the stories and articles that go along with them are rich with fascinating details. You have brought passion, creativity and professionalism to this project which is evident with every article. Keep up the wonderful work! Your devoted readers, myself included, cannot imagine the web without you. Happy Anniversary! I'm so glad I've gotten to "know" you through Shades and look forward to many more years of great articles! And The Guest Author Is . . .